The SR-26: What Is It? And What Happens Once It Is Issued? The Safety Responsibility-26 is commonly known as the SR-26, and it is a form that can only be filed by the insurance company that issues the California SR-22. The SR-26 is a document that lets the Department of Motor Vehicles (DMV) know that a driver’s SR-22 certificate is no longer valid. Essentially, the SR-26 cancels the SR-22 that was filed as required by the court. When Does the Insurance Company File the SR-26? Drivers who are required to have the SR-22 on file would need to have it for a specific time period. For example, the judge may have imposed a sentence of three years on someone who was convicted of a DUI. After this three-year period is over, the driver’s insurance company would need to file the SR-26 to inform the DMV that the SR-22 is no longer needed in this instance. Insurance companies will also file the SR-26 if their clients cancel their insurance policies. If the grace period ends and the formerly insured parties do not renew their policies, their insurers will file the SR-26 in this instance as well. What Happens After the SR-26 Is Filed? 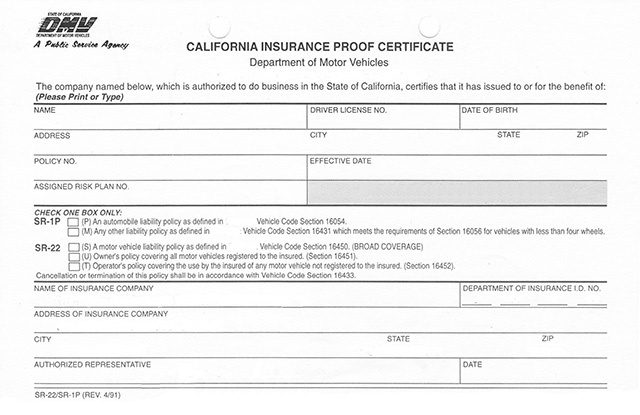 California drivers must insure that they do not allow their insurance coverage to lapse. If they do, their insurance companies will file the SR-26, and the DMV may suspend their licenses again. After this occurs, a new three-year period may begin. To avoid this, drivers must purchase a new policy right away if their current insurance companies are planning to cancel their coverage. If the insured parties decide not to renew coverage with their current insurance companies, they must have a new policy in place before their current coverage ends so that they never drive without auto insurance. How Does the SR-26 affect Auto Insurance Rates? The need to have the SR22 insurance form filed is not the cause of the higher premiums people in this situation must pay. Even if the SR22 insurance in California is not required, motorists convicted of a serious offense such as DUI will see an increase in their premiums. Therefore, the reason their insurance rates go up is because of the DUI and not because the SR22 California was required of them. Because higher auto insurance premiums are not necessarily related to the CA SR-22, auto insurance rates will not necessarily fall because it is cancelled. However, if these motorists maintained an excellent driving record throughout the time that they were required to have the SR-22 on file, auto insurance companies will examine the driving records and lower their clients’ risk assessments accordingly and potentially issue lower car insurance quotes.